Green tea, olive & coconut oils, sodium hydroxide, palm, palm kernel, avocado & grapeseed oils, shea butter, aloe vera gel, green clay, tea tree oil, vitamin E, grapefruit seed & rosemary extracts, balsam fir, cedar & juniperberry essential oils. What a fabulous combination! 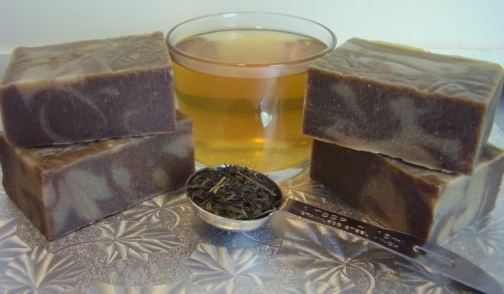 Due to it’s astringent, toning & purifying properties, green tea is considered a skin rejuvenator. 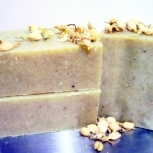 Tea tree is antiseptic and used to balance acne-prone skin. 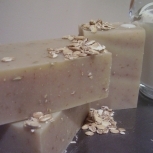 The addition of aloe vera gel adds to the cooling qualities of this bar. 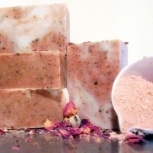 A combination of balsam fir, cedar & juniperberry essential oils make this an earthy, refreshing bar. 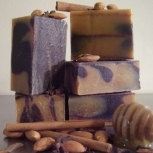 This bar is ideal for acne-prone, oily & mature skin types.